OSTEMER 324 Flex is a two-component resin for quickly building and assembling transparent, flexible multi-material microstructures. OSTEMER 324 Flex is a two-component resin for quickly building and assembling transparent, flexible multi-material microstructures. The key difference between our other resins is that the final mechanical properties allows for flex and deformation. 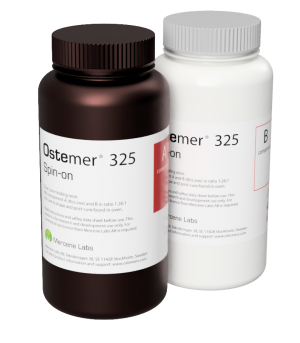 The OSTEMER 324 is a two-stage cure polymer. After mixing the two components the liquid resin is initially casted or injection molded, using a rapid UV-cure (365 nm), to form a rubbery sticker. The sticker is removed from the mold, aligned to a substrate or sandwiched with another material, and thereafter thermally hardened in oven to stiffen and form a bond. The OSTEMER 324 uses an epoxy bonding mechanism and can therefore bond to a very large range of different materials.